Her birth name may be Tardar Sauce (sic), but the Internet has rechristened and reclaimed her as its own – and you and I know her as Grumpy Cat. Yes, that all too lovable cat curmudgeon has risen to Web infamy since her owner posted that disgruntled mug on Reddit this past fall, and we all fell in love. The rest, as they say, is (meme) history. Naturally, Grumpy Cat is making an appearance at SXSW at the Mashable House, which went whole hog on the meme madness, featuring appearances from Scumbag Steve and the Nyan Cat creator as well. But these humans have nothing on the queue Grumpy Cat earned; the line wrapped around the block. In the rain. Even VIP badge holders were waiting, umbrellas or no, for a glimpse of Grumpy Cat. Doors opened at noon, local time, so I figured showing up around 11:30 a.m. to see, allow me to remind you, a cat, was more than generous. I was very, very wrong. The line was already wrapped around the corner, with somewhere around 100 adoring fans in front of me. Some were wearing Grumpy Cat shirts. Others practicing Grumpy Cat faces. All were ready to worship at the Grumpy Cat shrine. Fortunately, I snagged a bracelet that let me skip a considerable part of the line (no shame) – but it deposited me into yet another line, this one approximately 40 people long. At this point, I’d been waiting for about an hour-and-a-half to meet a cat. But I wasn’t alone – hardly. It was almost like the reception line of a coronation; people weren’t banshee-screaming like Beyoncé had just walked in, they were quietly waiting for their turns to greet the King (Queen?). The King of the Meme. The cat King of the Meme – which in Internetland, is the equivalent of Jesus. Finally, I made it inside the doors and out of the rain. I was briefed on the rules as my turn neared: No touching. One person at a time. I was told I may not interview Grumpy Cat. I wouldn’t dare, anyway. One look at that icy stare and I’d be silenced. And then, my turn. I stepped up to the throne pillow upon which Grumpy Cat sat, held there by two handlers. Yes, two. A few things you may not realize about Grumpy Cat: She is very, very tiny. Almost kitten-sized, actually, which just makes her perma-disapproval all the more adorable. She is also very sleepy, as the entire time I was inside the building, I did not see her open an eye. (My theory: sedatives. This remains unconfirmed.) Oh, and she is a she. Apparently most people assume Tardar is a male. I handed my phone over to the rep snapping photos. 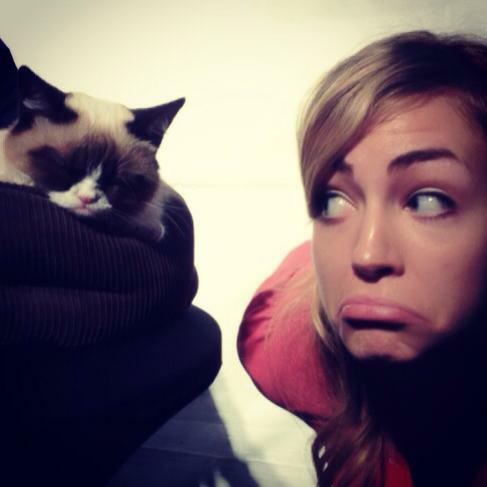 I positioned my face next to Grumpy Cat, and attempted to mimic her. It was all over so fast. My moment in the sun with Grumpy Cat came and went before I even knew what was happening. At the end of all this, I’m both embarrassed and thrilled by my meme-meeting. But I regret nothing. 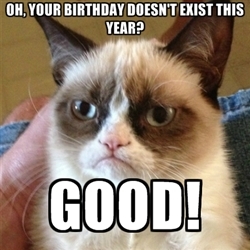 Here’s to you, Grumpy Cat: You are a SXSW treasure.